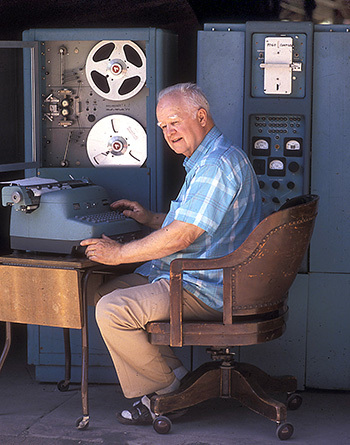 Harry Huskey with the Bendix G15, the first "personal computer." Harry Huskey, a pioneering computer scientist who worked on early computing systems and later helped universities around the world establish computer centers and computer science programs, died on April 9 at his home in Santa Cruz. He was 101. A professor emeritus of computer science at UC Santa Cruz, Huskey began his career teaching mathematics at the University of Pennsylvania. There, he worked on the famed ENIAC project in the 1940s. ENIAC was the first large-scale electronic computer, containing 18,000 vacuum tubes, and Huskey was among the last surviving members of the ENIAC team. In 1947, Huskey spent a year in England, where he worked with Alan Turing on a prototype of Turing's Automatic Computing Engine (ACE) computer. He joined the staff of the U.S. National Bureau of Standards in 1948 and was responsible for the design and construction of the National Bureau of Standards Western Automatic Computer (SWAC), the fastest computer of its time. While he was building the SWAC computer, Huskey was a contestant on Groucho Marx's You Bet Your Life radio show. Introduced as the designer of an "electronic brain," he was paired with a junk dealer on the May 10, 1950, episode. Huskey later served as a consultant to the Bendix Computer Division of Bendix Corporation, where he was primarily responsible for the design of the Bendix G15 computer. Designed for use by a single person, the G15 has been called the first "personal computer," although it was the size of a refrigerator, with an equally large tape unit for additional storage. Huskey had a G15 installed in his home in Berkeley in 1955 and later kept it in his Santa Cruz garage before donating it to the Smithsonian Institution in 1988. Huskey was on the faculty at UC Berkeley from 1954 until 1967, when he moved to UC Santa Cruz and became a founding faculty member of the computer and information science program. He set up the UCSC Computer Center and served as its director for over ten years. During his time at UC Santa Cruz, Huskey advised universities in many countries on how to develop academic computer science programs and establish computer centers. He retired in 1986 at the age of 70. Born in North Carolina and raised in Idaho, Huskey earned a bachelor's degree in mathematics and physics at the University of Idaho and M.S. and Ph.D. degrees in mathematics at Ohio State University. 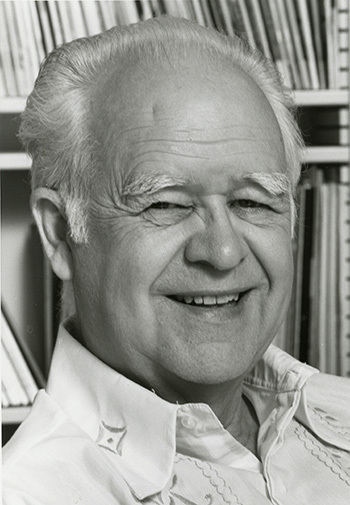 The recipient of many awards and honors, Huskey was a fellow of the Institute of Electrical and Electronics Engineers (IEEE), the British Computer Society, and the American Association for the Advancement of Science (AAAS). He received the 1984 Centennial Award from the IEEE and the 1982 Computer Pioneer Award from the IEEE Computer Society, and he was honored at the Pioneer Session of the National Computer Conference in 1978. In 2013, he was honored as a Fellow of the Computer History Museum in Mountain View, CA. In 2015, the Baskin School of Engineering and Office of Research at UC Santa Cruz presented Huskey with the Founding Faculty Award for his role in founding what is now the school's Department of Computer Science. Many of the earliest alumni and faculty attended the event to congratulate Huskey. "I'm glad we got Harry here to see what has grown from the seeds he helped plant and nurture," said Patrick Mantey, the Baskin Professor of Computer Engineering and founding dean of the Baskin School of Engineering. "He was already a legend in computing when I was early in my career." Huskey had four children with his wife, Velma, who died in 1991. In 1994, he married Nancy Whitney, who died in 2015. Huskey is survived by three daughters, a son, five grandchildren, and one great grandchild. Funeral services will be held at Santa Cruz Memorial (1927 Ocean Street Extension) at 1 p.m. on Saturday, April 15. To recognize and honor Huskey's many accomplishments and to allow his legacy to live on, particularly in the area of international engineering education, his family and two close friends from UC Santa Cruz have created the Harry Huskey Endowment for International Engineering Education at UC Santa Cruz (Huskey Endowment).